A picture window is unique in that it does not open or close. Rather, it essentially frames a view of the outdoors, much like a picture frame, providing a clear line of sight to your yard. Picture windows can also be placed on high walls where they can provide an excellent source of natural light for the interior of your home. If you have picture windows in your Louisville, Kentucky, area home that are drafty or otherwise showing signs of age, turn to Windows Plus to have them replaced. At Windows Plus, our motto is “quality comes first,” and our replacement windows are no exception. For your new picture window, you can choose from vinyl, composite, fiberglass, or a wood-clad frame, each of which are customizable by color and texture. One option that we recommend is our own Energy Wall line, which contains leading insulating features, such as multiple panes of Low-E glass, to make your home in the Louisville, KY, metropolitan area more energy efficient and help drive down your monthly energy bills. When it comes time for installation, you can trust that our team has the chops to complete a flawless picture window replacement. The technicians who will show up at your door specialize in window installations – they are not jacks-of-all-trades who install other home improvement products – and they’ve been factory trained. Furthermore, our turnarounds are typically faster than what our competitors provide, minimizing any inconvenience to you and your family. For peace of mind, we’ll include a lifetime warranty on your new picture window. 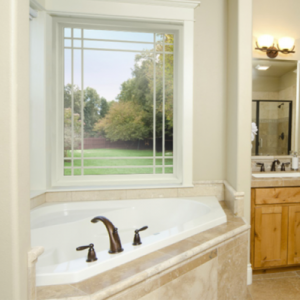 To speak with a representative about customizing a picture window for your home in Louisville or elsewhere in Kentuckiana, contact the experts at Windows Plus today.